Here are some snazzy birthday facts about 25th of August 1964 that no one tells you about. Don’t wait a minute longer and jump in using the content links below. Average read time of 10 minutes. Enjoy! What day was my birthday Aug 25, 1964? August 25, 1964 was a Tuesday and it was the 238th day of the year 1964. It was the 34th Tuesday of that year. The next time you can reuse your old 1964 calendar will be in 2020. Both calendars will be exactly the same! This is assuming you are not interested in the dates for Easter and other irregular holidays that are based on a lunisolar calendar. There are 128 days left before your next birthday. You will be 55 years old when that day comes. There have been 19,960 days from the day you were born up to today. If you’ve been sleeping 8 hours daily since birth, then you have slept a total of 6,653 days or 18.22 years. You spent 33% of your life sleeping. Since night and day always follow each other, there were precisely 675 full moons after you were born up to this day. How many of them did you see? The next full moon that you can see will be on April 19 at 11:14:00 GMT – Friday. Fun stat: Your first one billion seconds (1,000,000,000) happened sometime on May 3, 1996. If a dog named Nixxie - a Pomeranian breed, was born on the same date as you then it will be 236 dog years old today. A dog’s first human year is equal to 15 dog years. Dogs age differently depending on breed and size. When you reach the age of 6 Nixxie will be 40 dog years old. From that point forward a small-sized dog like Nixxie will age 4 dog years for every human year. Portuguese forces are defeated by the Kingdom of Kandy at the Battle of Randeniwela in Sri Lanka. Kitasato Shibasaburō discovers the infectious agent of the bubonic plague and publishes his findings in The Lancet. Ten days after World War II ends with Japan announcing its surrender, armed supporters of the Chinese Communist Party kill U.S. intelligence officer John Birch, regarded by some of the American right as the first victim of the Cold War. Egon Krenz, the former East German leader, is convicted of a shoot-to-kill policy at the Berlin Wall. The Tłı̨chǫ land claims agreement is signed between the Dogrib First Nations and the Canadian federal government in Rae-Edzo (now called Behchoko). Six people die and 22 are injured when a train derails in Huimanguillo, Tabasco, Mexico. What does my birthday August 25, 1964 mean? Your birthday numbers 8, 25, and 1964 reveal that your Life Path number is 8. It represents experience, authority and endeavour. You are gifted with natural leadership and the capacity to accumulate great wealth. The following celebrities also have the same life path number: Chespirito, Shanna Moakler, Chris Montez, Danny Woodburn, Arwyn Davies, Joyce Howard, Lew Anderson, Mark Stein, Lisa Ortiz, Catherine O'Hara. 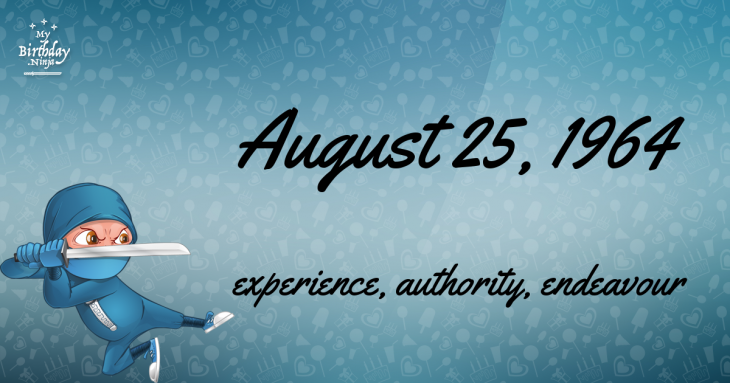 What is the birthday horoscope for Aug 25, 1964? The Western zodiac or sun sign of a person born on August 25 is Virgo ♍ (The Maiden) – a mutable sign with Earth as Western element. The ruling planet is Mercury – the planet of communication. According to the ancient art of Chinese astrology (or Eastern zodiac), Dragon is the mythical animal and Wood is the Eastern element of a person born on August 25, 1964. Fun fact: The birth flower for 25th August 1964 is Poppy for preparedness. What is the Love Match for Aug 25, 1964? When it comes to love and relationship, you are most compatible with a person born on November 12, 1989. You have a Love Match compatibility score of +194. Imagine being in love with your soul mate. On the negative side, you are most incompatible with a person born on November 19, 1971. Your incompatibility score is -212. You’ll be like a cat and a dog on a love-hate relationship. Arf-arf, I want to bite you. Meow-meow, stay away from me! How many babies were born on August 25, 1964? Base on the data published by the United Nations Population Division, an estimated 115,215,976 babies were born throughout the world in the year 1964. The estimated number of babies born on 25th August 1964 is 314,798. That’s equivalent to 219 babies every minute. Try to imagine if all of them are crying at the same time. What is the popular baby name on 25 Aug 1964? Here’s a quick list of all the fun birthday facts about August 25, 1964. Celebrities, famous birthdays, historical events, and past life were excluded. 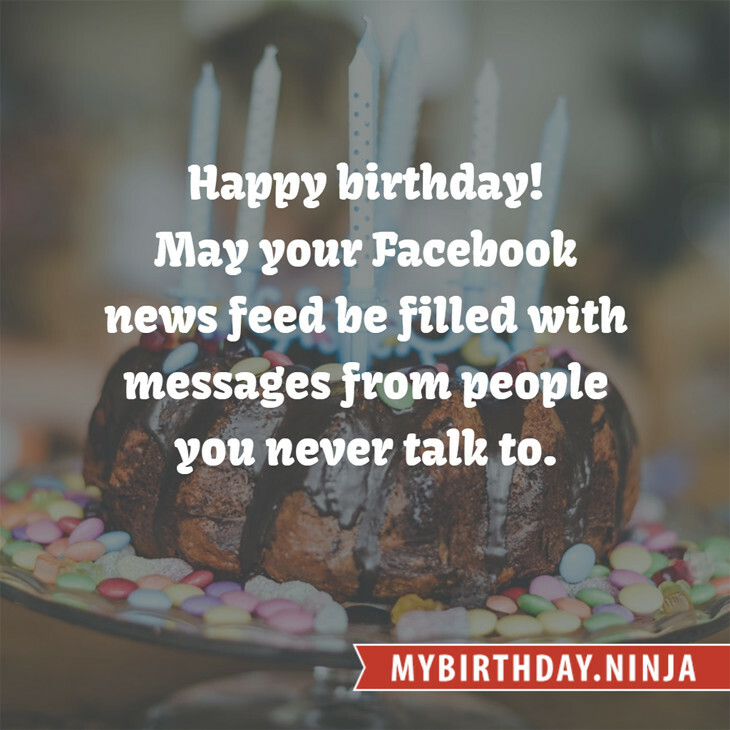 Try another birth date of someone you know or try the birthday of these celebrities: July 28, 1966 – Shikao Suga, Japanese singer-songwriter and guitarist; November 4, 1953 – Peter Lord, English animator, director, and producer, co-founded Aardman Animations; March 13, 1976 – James Dewees, American singer-songwriter and keyboard player (The Get Up Kids, Leathermouth, Coalesce, and Reggie and the Full Effect).